Revolutionize how you work. Find more success in work and in life than you ever dreamed possible – by pursuing fun. The demands of work and the breakneck pace of technological change wear heavily on all of us, whether we are employees at a large company, solo workers in the gig economy, or entrepreneurs launching a new venture. The “hustle-and-grind” lifestyle that we’ve been told is essential to success actually leads to physical ailments, emotional burnout and a darkness in the soul. But Joel Comm has found a better way. 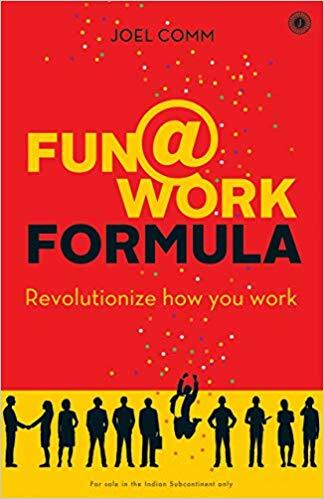 In Fun@Work Formula, Comm reveals that the best path to success – in work and in life – is to focus on our passions, curiosity and the things that bring us great pleasure. Doing this leads not only to more dramatic results in whatever we do, but also to a more fulfilling life. Using entertaining stories and illuminating anecdotes from Comm’s own life and those of others, famous and not, Fun@Work Formula lays out a plan for making the subtle changes to our thinking and routines that will enable us to design the life we truly desire: one of significance and joy.